This post comes from Qalvy Grainzvolt of the Shinnyo Center for Meditation and Well-Being, our partner for Wednesday morning Walking Meditation. Since last summer, I have had the privilege of leading the free walking meditations at Bryant Park. For 28 Wednesdays over the last year-and-a-half and counting, I began looking more deeply into the history of Bryant Park. It is natural to want to know more about the space where I have spent a fair deal of time in teaching. Through my research, I learned that Bryant Park has gone through many transformations over the years, and that the New York Public Library adjacent to it maintains vast archives 17 feet below ground – possibly located right beneath the ground upon which the walking meditators trod every Wednesday morning! The more I researched the origins of Bryant Park, the more my curiosity expanded into the surrounding venues, too, such as the library and its stunning architecture. Patience the Lion sits in front of the NYPL, well, patiently. Several hours of reading got me wondering what besides nature makes pristine Bryant Park and its architecture ideal for meditation. The two lions (known as the “Library Lions”) gazing over Fifth Avenue have something to say about meditation, I realized. In the 1930s, Fiorello LaGuardia, the Mayor of New York City, named the two marble lions Patience and Fortitude. Mayor LaGuardia felt that patience and fortitude were the qualities that New Yorkers would need to embody in order to weather the storm of the economic depression of those times. These majestic lions do not roar, but one might say that they “speak” to those of us who admire the statues. As I walk past Patience and Fortitude, I am reminded that these qualities are essential for a blossoming meditative practice. Because with patience and fortitude, we have the ability to fill our day with mindful moments. It is the accumulation of these moments that leads to greater awareness, calm and focus. 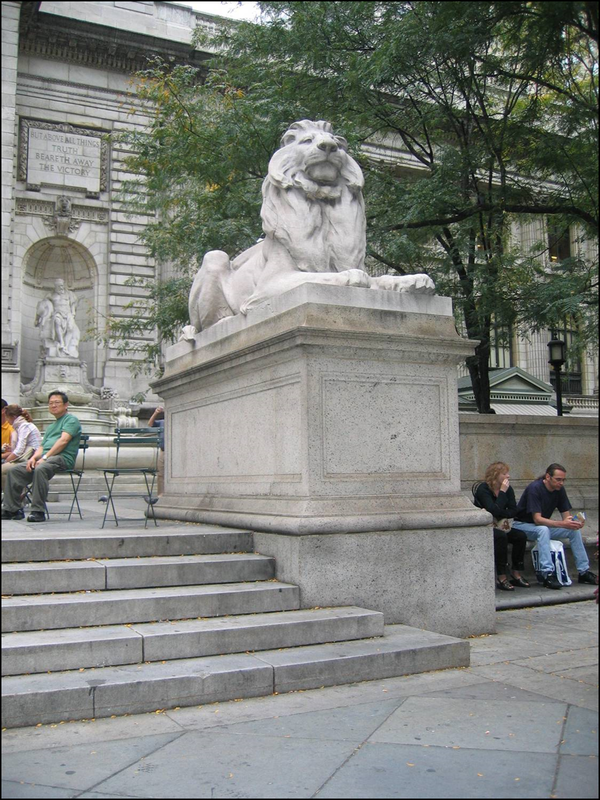 So, in seeing Patience (seated on the south side) and Fortitude (guarding the north end), the Library Lions become vivid reminders that bringing a mindset of patience and fortitude to any meditative endeavor is a sure-fire way to nourish it. Class participants take deep breaths before starting the walking meditation practice. It is also a reminder that daily life and all its sights and sounds hold opportunities for us to realize something deeper that can help nourish our mental, physical and emotional well-being – anywhere and at any time. While we may feel refreshed by the beautiful, calm surroundings of nature, such as in Bryant Park, we should also have a lion’s courage to be open and deeply aware of situations in our daily life. We can be find inspiration in everyday, seemingly routine experiences – even those along the city’s busiest walkways and crossroads. And those experiences can reveal awakening and wisdom in the most unexpected ways, whether they are marble lions or something less striking.